The Mudd Library isn’t just a place to study, or to search for and gather materials. Libraries offer so much more, and the Mudd is no different! Printing projects and papers and presentations, oh my! We have everything you need to put the finishing touches on your papers and projects. 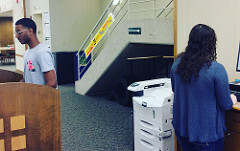 Make copies, print your paper, or use the scanner. We have a universal phone charging station if you’re running low. We have staplers, tape, paper clips, rulers, and all kinds of other accoutrements to help you polish your assignments and hand them in with pride. Do you need another primary or secondary source to support your argument? Looking for an open-source photo to add to your slides or for the proper citation for your paper? The reference librarians are here to help you find what you need and engage in the best and most thorough research possible. We aim to help you feel confident and supported as a student researcher. Curious about what’s happening on campus? Looking to find local thrift stores, coffee shops, or parks? Not sure when that concert starts tonight? Stop by, we’ll help you find out! All of your friends are here! Hang out on the first or second floor to discuss, debate, and collaborate. Chat, vent, laugh, share. Sometimes just sitting next to someone who is working as hard as you are can be the most valuable resource. Snap some pics or make a vid! Then get back to that group project! Pull up a whiteboard and teach each other what you’ve learned. Ask someone out on a study date. The options are endless. The third and fourth floors are meant for quiet study. They also make a great place to read, reflect, daydream, or nap. Write that paper! No one will barge in just as you get in your groove. Or, if you’ve been in your groove and need a little break, stop down to the first floor to nurture yourself with a cup of tea. Text your mom and then get back at it. The library is for everyone, and everyone is welcome here and treated with respect and dignity! Getting productive while enjoying the peace and of the fourth floor. A quiet place to get some work done? As you may know, the Mudd Library and Warch Campus Center provide a free New York Times subscription to all Lawrence University students, faculty, and staff. Just sign up on campus at nytimes.com/passes with your Lawrence email address (your account may be accessed off-campus once it’s been created). The subscription provides access to the electronic version from a browser and through NYTimes mobile applications. The Upshot – News, analysis and graphics about politics, policy and everyday life. Subscribe to the newsletter as well. Elections – News about elections, including commentary and archival articles published in The New York Times. The Argument– New York Times Opinion columnists explain an argument from each side of the political spectrum, so you can decide where you stand and how to persuade the opposition. Check out the section and podcast. The Daily podcast – This is how the news should sound. Twenty minutes a day, five days a week. Tune in along with five million monthly unique listeners. Race/Related – A weekly newsletter focused on race, identity and culture. Prefer a different news resource? The Mudd Library subscribes to a wide variety of newspapers in both paper and electronic formats! Lawrence University is hosting the symposium, Seeking Refuge: Local and Global Perspectives, from November 4 through November 6, 2018. This symposium is meant to bring awareness of the global issue of the refugee crisis by hosting discussions with community featuring guests with a wide range of backgrounds in helping refugees and who are refugees themselves. The schedule for the symposium can be viewed on the Refugee Symposium webpage. This guide contains links to many resources available in the library and online for those who would like to continue their enrichment about the topic of refugees. 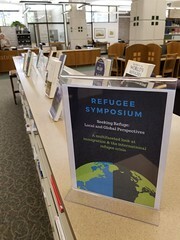 In addition to books, movies, and journals, the guide also contains links to our music databases to a selection of songs played at the refugee symposium concert. 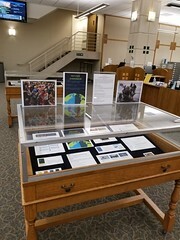 The display contains powerful photographs and news headlines that illustrate the refugee plight, facts about refugees around the world, and tips for finding related resources in the library catalog and OneSearch. All along the top of the newspaper and popular magazine shelf, we’ve placed a selection of library materials about the refugee experience. No need to search or go upstairs to find materials, just grab some books you’d like to read from this display and sit down to read them, or check them out at the circulation desk. Your friends in the Mudd Library are glad to be supporting a symposium on such an important topic and to help with continuing the discussion. Prepare for the Solar Eclipse! 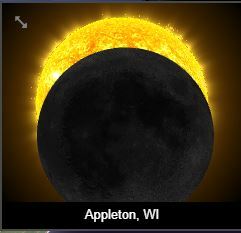 Simulation of the eclipse view from Appleton in NASA’s interactive web app. If you’re as excited about the upcoming solar eclipse as we are, you’re probably interested in learning more. We’ve found a few awesome resources that will help you to not just enjoy the eclipse, but understand more about the science that’s making it happen. Want to know what the eclipse will look like from where you’re located? NASA has used their NASA’s Eyes technology to create a web application that will simulate the path of the eclipse. Just add your location! Resources for safely viewing the eclipse include; how to create a solar viewing projector, 3D and 2D printable pinhole projectors, and safety precautions that should always be followed when viewing an eclipse. A list of NASA-approved glasses and viewers is available as well. In anticipation of the eclipse, the Appleton Public Library is hosting NASA Ambassador, Bob Schmall, to talk about the significance of this event. The eclipse will happen on Monday, August, 21, 2017. Remember- make sure to be safe when viewing the solar eclipse, and never look directly at it without approved eye protection! The Mudd Welcomes Lan Samantha Chang to Lawrence! Spring term finals are over and the hustle and bustle of students writing, reading and concentrating intently in the busy, buzzing library has given way to quiet stillness. This can only mean one thing: Commencement is just a few days away! If you’re as excited as we are about Lan Samantha Chang delivering this year’s commencement address, you’re in luck. We’ve created a display featuring all three of the Appleton native’s novels. The display also features The Workshop: Seven Decades of the Iowa Writers’ Workshop – 43 Stories, Recollections, & Essays on Iowa’s Place in Twentieth-Century American Literature. This book is a compilation of works created by participants in the Iowa Writers’ Workshop, of which Chang is the current director. If you’re wondering what to do with the several days before commencement, stop by the Mudd and check out some of Chang’s work before she arrives. Thanks for a fabulous academic year, everyone, and congratulations to our graduating seniors! Join us as we welcome Lan Samantha Chang back to Appleton. 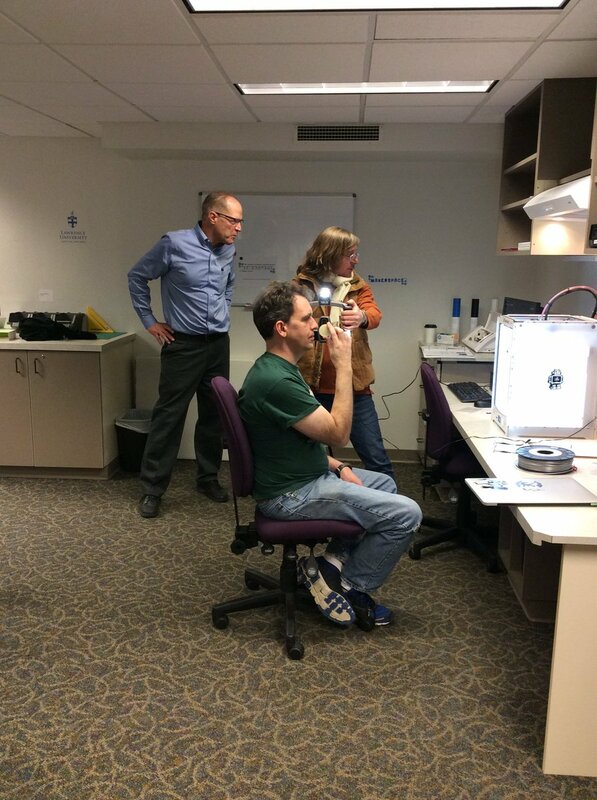 Have you heard about the new Lawrence University Interdisciplinary Makerspace for Engaged Learning? It is an exciting space for hands-on learning and creation, located on the first floor of the Mudd Library. A makerspace is any space that encourages making, tinkering, and creativity. Some are focused more on technology, some on manufacturing, some on building, and some on crafting. Our space is a little of each of those with an academic focus. The LU makerspace includes two 3D printers, a desktop 3D scanner, a handheld 3D scanner, an electronic cutter, a sewing machine, and supplies for painting and making collages (learn more on our guide). The space also houses the digital conversion lab. 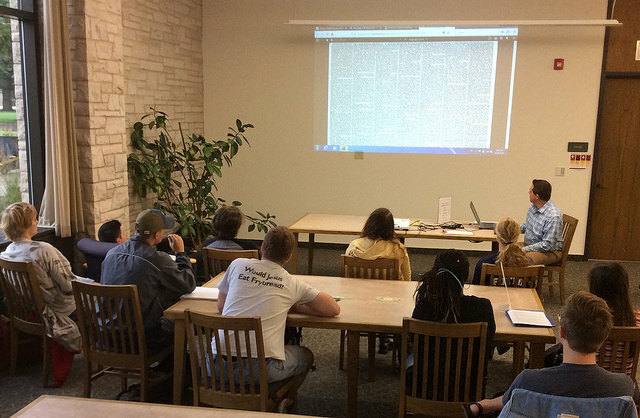 Instructional Technologist Arno Damerow, Reference Librarian Angela Vanden Elzen, and Associate Professor of Chemistry Dave Hall oversee the daily use of the space, work with students and classes, and plan makerspace events and speakers. A large group of Lawrence faculty and staff, including Anna Simeth from the Development office, contributed to the grant proposal to the Associated Colleges of the Midwest (ACM) that allowed for the purchase of much of the equipment. Read more about how this great space came to be (thanks to help from our friends in Technology Services, Facility Services, and Provost Dave Burrows), read about assignments, and view documentation on the makerspace website. Keep up with recent news and uses of the space with the makerspace Twitter account. Part of the grant from the ACM included funding to bring in speakers to discuss the idea of maker pedagogy, and how to integrate it into higher education. Our first speaker, Matt Sonnenberg from the University of Wisconsin – Stevens Point, will present on March 31st at 11:10 a.m. in the Warch Campus Center Cinema. Matt will share his experiences with integrating 3D printing into classes on the UWSP campus. All are invited to attend this presentation. Have questions about the makerspace or interested in using the space with your classes or an independent study? Contact us at makerspace@lawrence.edu. 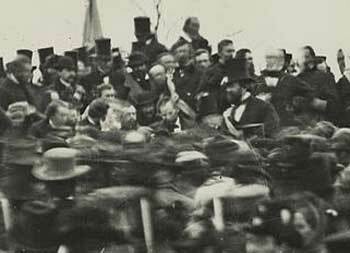 Abraham Lincoln at Gettysburg, November 19, 1863. Enlargement from glass plate negative. Brady-Handy Collection, Prints and Photographs Division, Library of Congress Digital ID # cwpb-07639. As well as unfavorable reviews. Care to read it for yourself? The text of the speech that has been inscribed on the wall of the Lincoln Memorial can be found on this Library of Congress page. If you’d like to see the original drafts, The Library of Congress owns what is known as the “Hay Draft” and the “Nicolay Copy” and has made them available as part of their online Gettysburg Address exhibition. The Mudd Library’s Lincoln Reading Room contains an interesting collection of Abraham Lincoln-related documents, pictures, and works of art- including bronze casts of President Lincoln’s hands and face. “Contemporary Reactions.” The Gettysburg Address. Cornell University Library, 2008. Web 18 November 2013. “Gettysburg Address.” Encyclopedia of American Studies. : Johns Hopkins University Press, 2010. Credo Reference. Web. 18 November 2013. “Gettysburg Address.” The New Dictionary of Cultural Literacy, Houghton Mifflin. Boston: Houghton Mifflin, 2002. Credo Reference. Web. 18 November 2013. “The Heroes of July.” The New York Times. 20 November 1863. The Learning Network: Teaching and Learning With The New York Times. Web. 18 November 2013. 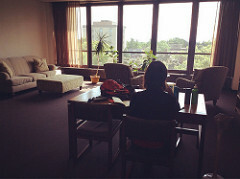 Whether you are looking for a cookbook, exercise video, or just need to get out of the heat, the Mudd Library is your place for summer wellness. Take a look at a few items from the library collection that will help you on your path. The Food Matters Cookbook Contains 500 recipes to improve your health, and your impact on the environment. American Dietetic Association Complete Food and Nutrition Guide This guide covers a variety of topics relating to healthy living- from facts about vitamins and minerals, to nutrition for athletes. Zumba Fitness Created by Alberto Perèz, fitness trainer and choreographer. Have fun and get in shape with Latin rhythms and upbeat dance moves. Set includes DVD and toning sticks. More Yoga for the Rest of Us Instructional DVD of lower-impact yoga for stretching, balance, strength, and relaxation. 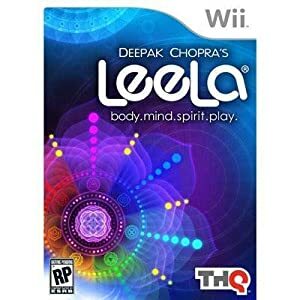 Deepak Chopra’s Leela: Mind, Body, Spirit, Play This Nintendo Wii video game was designed with the guidance of Deepak Chopra to teach meditation and relaxation exercises. Just Dance 3 Dance along with a selection of more than forty popular songs. For the Nintendo Wii. How Full is Your Bucket? Learn how to make the most of your interpersonal interactions at work and at home. If, like many of us at the Mudd, you believe that wellness comes from relaxing with a good book- take a look at some staff favorites from our recent coffeehouse. Like elves in a workshop, your friends at the Mudd Library have been busily preparing all kinds of great new stuff during winter break. We’d like to take a moment to highlight a few. Interested in watching some classic musicals? We now have DVDs of some of the best, including (but not limited to) Fiddler on the Roof, Bye Bye Birdie, and Annie Get Your Gun. Speaking of classics, we have also just added the entire set of the original Japanese Godzilla movies. We’ve recently acquired some very interesting books from a wide variety of genres. Read Tonight No Poetry Will Serve, written by one of the “essential voices of our time,” Adrienne Rich. Our collection of dance resources has been greatly expanded with titles such as, Envisioning Dance on Film and Video. Learn about the archaeological field of prehistoric warfare with Warfare in Prehistoric Britain. Need something to reinforce your fears of a zombie apocalypse? Check out the most recent volumes of the terrifying and amazing, The Walking Dead. 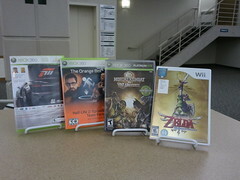 We’ve also added some new video games, including what has been referred to as, “the Wii game we’ve been waiting for,” The Legend of Zelda : Skyward Sword. Three Xbox 360 games have also been purchased, and will soon be ready for checkout. Of course, this is just a small sampling of some of our new acquisitions. After you’ve enjoyed your winter holiday festivities, stop by the library and take a look! 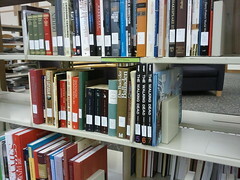 Many of the Mudd Library’s databases include a feature called search alerts. This feature allows a user to be notified when new records matching a specific search are added to the database. With search alerts, you can choose to be notified through a RSS reader such as Google Reader, or via email. Still not really sure what a search alert is? Say you are searching in Academic Search Elite for interested film reviews for the movie The Battle of Algiers.﻿ After you have submitted your search, select search history, then click on the orange RSS button. A window will then pop up with a RSS link, as well as the option to have the notifications sent via email. Our reference librarians are happy to answer your questions about search alerts, RSS feeds, or anything else. Check out our Ask a Librarian page for a variety of ways to get in touch, or just visit the reference desk. For more information about the EBSCO database search alerts, take a look at their, Using One-Step RSS Alerts page. For Gale database search alert support, see their Search Alerts and RSS Feeds page.